Visit Drugstore online at Drugstore.com for an online drugstore with a world of products and the expertise to help you find what you need. Health, beauty, wellness, personal care and pharmacy. With over 200,000 prescriptions filled, you can rest assured your prescription is in good hands. 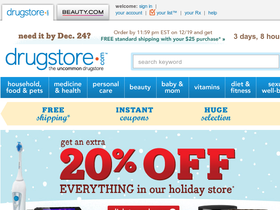 Find extra Drugstore.com savings, Drugstore.com coupons and Drugstore.com discounts here on 58Coupons.com. As a returning drugstore.com customer you can get free shipping when you spend $49 or more. New customers only need to spend $25! Click link to get started. At Drugstore you can save up to $12 on diapers. Click link to browse and save today. Transfer your prescription to Drugstore.com and get $30 of credit to spend on your nonprescription favorites! Plus, you’ll get $10 more for each of your next two refills. With drugstore dollars™, you earn a 5% credit on every order to spend on future purchases. The dollars get credited to your account automatically! Click link to get started. Head over to Drugstore.com where you can enjoy free gifts with select purchases. Click link.